in de Vereenigde Nederlanden|Naamlijst]] </em>erroneously called Old Flemish), meeting at the "Zwitsers waltje"; it was founded about 1600, and greatly prospered in the early 17th century. (In 1603-1612 [[Theunisz, Jacob (ca. 1569-1625)|Elder Jacob Theunisz]] baptized 97 persons here.) In 1695 its membership numbered only 21, and in 1758 the few remaining members joined the United Waterlander-Flemish congregation. Their last preachers were Jan Gerbens until about 1740, Siebrand Douwes 1715-ca1750, Hendrik Benedictus ca. 1750, Meinert Daniels 1741-1758, who still served the United congregation after the merger until he resigned in 1769, and Pieter Cornelis van 't Veer 1752-1758.</li> <li>A Waterlander congregation, which met at the Wirdumerdijk, which had about 100 baptized members in 1695. The oldest meetinghouse has disappeared; a new frame meetinghouse was built in 1631; it was completely renovated in brick in 1760, rebuilt in 1760, and again rebuilt and enlarged in 1850 as may be seen by a commemorative stone tablet. Other renovations took place in 1889 and later. The old pulpit and organ of the Amsterdam [[Toren (Amsterdam, Noord-Holland, Netherlands)|Toren]] meetinghouse, which had been in the Amsterdam Zonist church, were bought by the Leeuwarden congregation and installed on 20 June 1813.</li> <li>There probably was also a [[Frisian Mennonites|Frisian]] congregation, although nothing is known about it.</li> <li>Of a High German congregation there is only one literary trace. It must have merged with the Waterlander congregation before 1647.</li> <li>A congregation of Pieter Jeltjes-volk is also mentioned here.</li></ol> The Mennonites of Leeuwarden had much trouble with the city magistrates until the 18th century. In 1596 the Reformed preacher [[Acronius, Ruardus (d. 1611)|Ruardus Acronius]] obtained permission from the magistrates to enter the meetings of the Mennonites "op het Niewland" (i.e., of the Waterlanders on the Wirdumerdijk) to interrupt the preacher. This led to the [[Leeuwarden Disputation (1596)|Leeuwarden disputation]] of 1596. Especially [[Bogerman, Johannes (1576-1637)|Johannes Bogerman]], who was a Reformed minister at Leeuwarden (1604-1626) and professor at the Franeker University (1636-1637), opposed the Mennonites. He succeeded in setting the magistrates against the Mennonites. In 1631 Lamberts Jacobs, the Waterlander preacher, was fined twice because he had ventured to preach in the new church against the will of the government. Especially the Janjacobsz group occupied the attention of the authorities. They were exhorted by the magistrates in 1670 and 1675; perhaps their strict practices of banning and shunning gave the government a justifiable reason to take action. In 1687 Jacob Jansen Voogt, preacher of the Waterlander congregation, was banished because of [[Socinianism|Socinianism]], but residing in the city was permitted and even preaching, on condition that he be examined beforehand by the Reformed ministers. There is also evidence that the city government was kindly disposed to the Mennonites. Marcelis Goverts, a Mennonite, was appointed city architect and when he and his wife, Mayke Marcus, founded a Hofje (home for old women) on 11 December 1658, which was presented to the deacons of the Waterlander congregation on 16 August 1659, the Court of Friesland gave its approval notwithstanding the fact that the Reformed Church of Leeuwarden contested the right of the Mennonites to administer the old people's home. Yntema, J. and Nanne van der Zijpp. "Leeuwarden (Friesland, Netherlands)." Global Anabaptist Mennonite Encyclopedia Online. 1957. Web. 23 Apr 2019. http://gameo.org/index.php?title=Leeuwarden_(Friesland,_Netherlands)&oldid=100170. Yntema, J. and Nanne van der Zijpp. (1957). Leeuwarden (Friesland, Netherlands). Global Anabaptist Mennonite Encyclopedia Online. 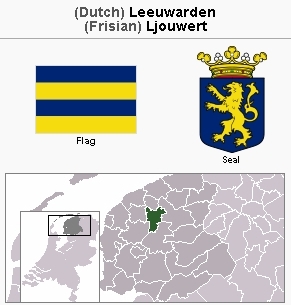 Retrieved 23 April 2019, from http://gameo.org/index.php?title=Leeuwarden_(Friesland,_Netherlands)&oldid=100170.